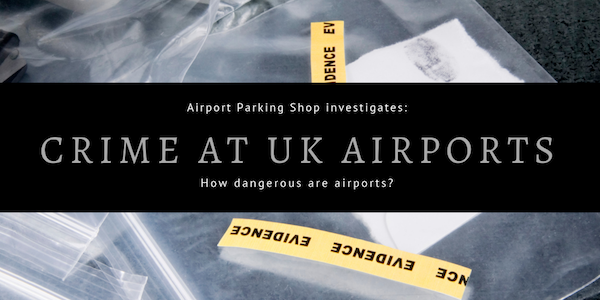 Airport Crime | How dangerous are our airports in the UK? The good news is, crime rates at airports are really, really low. 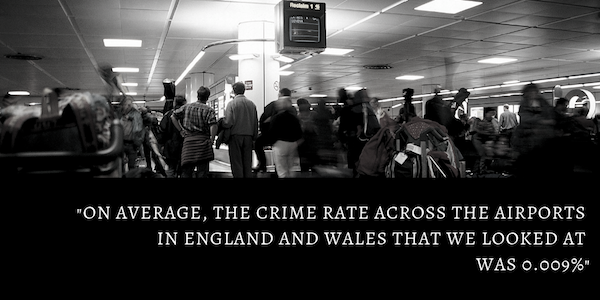 On average, the crime rate across the airports in England and Wales that we looked at was 0.009%. This was for crimes recorded as a percentage of passenger volume at the airport. In England and Wales, using 2018 figures, the rate was around 0.086% (ONS, 2018). So that’s a decrease of 162%, which is a nice figure to know if you’re worried about being a victim of crime! So what types of crime do you need to be wary of at airports? Find below the types of crime that have been recorded at airports in England and Wales and what they mean. Which airport is the most dangerous? Technically, the airport with the most crimes recorded is Heathrow. It would be a misnomer however to claim that this is the most dangerous airport because it also has the highest volume of passenger traffic! As a percentage of the passengers, its volume of crime is actually well below the average at 0.006%. Interestingly, if we were to think about personal safety, and only count violent crime that may affect you as a passenger, the result is a little bit different. For example, if we only include weapons possession, public order, robbery, theft from a person, and violence and sexual offences, then Gatwick Airport moves out of the safest airports group and is replaced by Belfast City, which implies there is proportionally more violent crime at Gatwick. There is an argument to say that by including the smaller airports the data is skewed slightly as due to the lower volume of passengers there is less chance of things going wrong. So let’s look at the major airports in England and Wales; Heathrow, Gatwick, Manchester, Stansted, Luton, and Birmingham. Out of these airports, London Stansted Airport unfortunately comes out the worst with the highest crime rate. It also has one of the highest rates of criminal damage and arson, and the highest rate of weapons possession! On the contrary, Gatwick Airport comes up as the safest of the major airports when you look at crimes per passenger volume. The rates of crimes across the board are all mostly below the average, and in only once instance – theft from the person – does it come out near the top. So, you might want to keep an eye on your pockets and luggage, but we’d recommend that in any airport! How safe is my vehicle when parked at the airport? This was our motivation to research this data and we are pretty encouraged by the outcome. 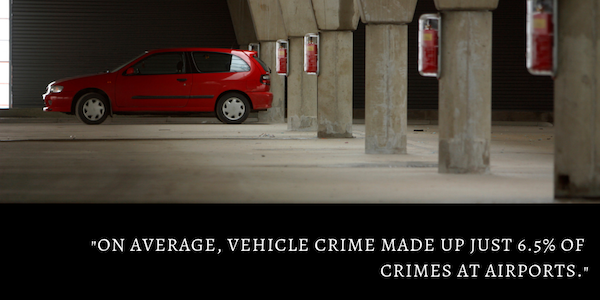 On average, vehicle crime made up just 6.5% of crimes at airports. Anti-social behaviour, other theft, shoplifting and violence and sexual offences were all much more common across the airports. However, there are three airports that stand out as having much higher than average vehicle crime rates. Birmingham tops the table at over 17% of crimes being related to vehicles, followed by Manchester at 14.65% and Leeds at 12.16%. Most other airports were comfortably between 0-8%. We contacted the police forces who are responsible for Birmingham, Manchester and Leeds Airports for comment about these high rates. Steven Jobson from the West Midlands Police Airport Unit told us that unfortunately 2018 was a very unusual year for vehicle crime at the airport. They had a series of incidents that were all caused by a “career criminal”, as well as a spate of crimes carried out as revenge against a particular company. This activity is of course not that common and has unfortunately skewed the figures for the year! Likewise, when PS Neil Perkis from Leeds Bradford Airport Police responded to our query regarding their high vehicle crime rate, we found out that the airport car parks were targeted by an organised crime unit intent on stealing satnavs. They have made several arrests in connection to these crimes and since then their vehicle crime rate has decreased. Check for a “Park Mark”, which is an award given to car parks that have passed certain tests. Read more about the Park Mark Award here! So what crimes are the most common at airports? Below you can see what the most common crime at each airport is. Where the most common crime is “Other theft” we’ve included the second most common as well as “other theft” is quite a vague category! You can take comfort from the fact that in most cases the most popular crimes at airports are not actually the violent ones. 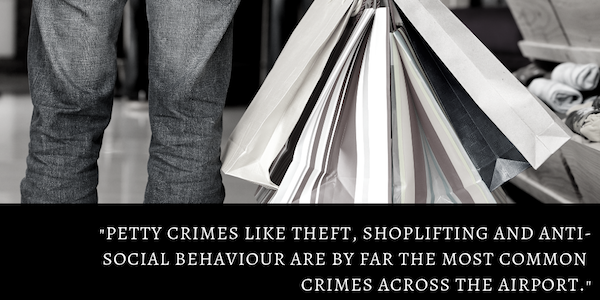 Crimes like theft, shoplifting and anti-social behaviour are by far the most common crimes across the airport. Plus, we were very encouraged to see that the overall crime rate at airports is pretty low, which is good news for your airport parking and for any concerns you may have when travelling! You must be 13 years old or older to comment on this blog.